A wide range of document collections are handled by this department with work divided among three groups. 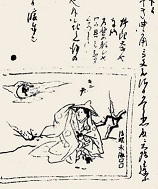 The first group is responsible for preparing Part XII of the Dai Nihon Shiryo series, which includes early Edo period events in chronological order. The second group handles political and cultural records for the entire early modern period, publishing them as the Dai Nihon Kinsei Shiryo series and as the selections in the Dai Nihon Kokiroku. The third group focuses on the end of the Edo-period and the Meiji Restoration. It is responsible for producing the Dai Nihon Ishin Shiryo and a selection of the Dai Nihon Komonjo.